Chalon-sur-Saône is a city and a commune in the Saône-et-Loire department in the Bourgogne-Franche-Comté region of France. It is the largest city of the department; however, the department capital is the smaller city of Mâcon. Though the place where is Chalon-sur-Saône now was an important town of the Aedui (Celtic people that lived between the Saône and Loire rivers) and objects of La Tène culture have been found here, the first mention of the town, as Cavillonum or Cabillonum, is found in Julius Caesar's Gallic Wars (VII, chs. 42 and 90). Chalon-sur-Saône is on the sides of the Saône river, in the south of the Bourgogne-Franche-Comté region. The city is at 338 km (210 mi) to the southeast of Paris and at 132 km (82 mi) to the north of Lyon. It has an area of 15.2 km2 (5.9 sq mi), and its average altitude is 182 m (597 ft); at the city hall, the altitude is 178 m (584 ft). 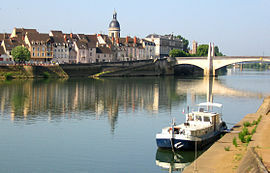 The Saône river flows through the eastern part of the city and the small river Thalie flows through the western part of the commune. Chalon-sur-Saône is surrounded by the communes Fragnes, Crissey, Châtenoy-en-Bresse, Saint-Marcel, Lux, Saint-Rémy, Châtenoy-le-Royal and Champforgeuil. The climate of Chalon-sur-Saône, in the Köppen climate classification, is Cfb - Oceanic climate with template summers. The inhabitants of Chalon-sur-Saône are known, in French, as Chalonnais (women: Chalonnaises). With a population of 44,985, Chalon-sur-Saône has a population density of 2,956 inhabitants/km2. Chalon-sur-Saône forms, with other 9 communes, the urban area of Chalon-sur-Saône, with a population of 74.357 inhabitants (2013) and an area of 93.8 km2 (36.2 sq mi). This urban area is the centre of the metropolitan area of Chalon-sur-Saône, formed by 90 communes with a population of 134,568 inhabitants (2013) and an area of 1,046.8 km2 (404.2 sq mi). Chalon-sur-Saône-1 formed by 5 communes and part of Chalon-sur-Saône, with 19,093 inhabitants (2014). Chalon-sur-Saône-2 formed by part of Chalon-sur-Saône, with 20,983 inhabitants (2014). Chalon-sur-Saône-3 formed by the commune Châtenoy-le-Royal and part of Chalon-sur-Saône, with 19,559 inhabitants (2014). It is part of the intercommunality Le Grand Chalon (French: Communauté d'agglomération Le Grand Chalon). St. Vincent's Cathedral on the Saint-Vincent Square, which has some elements from the eighth century. Musée Nicéphore-Niépce, a museum on photography. Musée Vivant-Denon, an art museum. Nicéphore Niépce (1765-1833), pioneer of photography. ↑ "Les élus" (in French). Ville de Chalon-sur-Saône. Retrieved 23 June 2017. ↑ Julius Caesar, Commentarii de Bello Gallico, Book 7, 42, 90. There is an English translation in Wikisource. ↑ 3.0 3.1 "La ville de Chalon-sur-Saône". Annuaire-Mairie.fr (in French). Retrieved 15 November 2014. ↑ "Commune de Chalon-sur-Saône (71076)". Comparateur de territoire (in French). Institut national de la statistique et des études économiques - INSEE. Retrieved 23 June 2017. ↑ "City of Chalon-sur-Saône". Map-France.com. Retrieved 15 November 2014. ↑ "Chalon-sur-Saône (71100)" (in French). habitants.fr. Retrieved 15 November 2014. ↑ "Régions, départements, arrondissements, cantons et communes" (PDF). Populations légales 2014 (in French). Institut national de la statistique et des études économiques - INSEE. Retrieved 23 June 2017. ↑ "Unité urbaine de Chalon-sur-Saône (71501)". Comparateur de territoire (in French). Institut national de la statistique et des études économiques - INSEE. Retrieved 23 June 2017. ↑ "Aire urbaine de Chalon-sur-Saône (060)". Comparateur de territoire (in French). Institut national de la statistique et des études économiques - INSEE. Retrieved 23 June 2017. ↑ "Une tradition d'échanges à l'échelle européene". Chalon-sur-Saône. Retrieved 15 November 2014. Wikimedia Commons has media related to Chalon-sur-Saône. This page was last changed on 17 November 2017, at 13:51.